Lots of companies and website owners these days have social media profiles in one form or another, be it Twitter, Facebook, Google+, or any other. They don’t necessarily know why they have got it. They have just been told they probably should have one. But understanding what and why your social media is for will help your business grow. What is it that you are trying to achieve? Why you are using your social media for. You should have a proper think about that before creating your social media account or page. You are probably using social media to get more conversions. Everybody wants more business from any source possible, and social media can be a really big way of achieving that. If you do it correctly, you can also raise your brand awareness in social media which will ultimately become your customer. You may have the best product, but if nobody knows about it then, social media is a great way to spread the word and get people into your business. You may also be using it for service. Social media is used more widely now as a great way to get in touch with you as well. If your customer has a problem or have any issues with your delivery they have had anything, they can contact you quickly and easily and in real time. This is another place where you do not do it correctly and seem to fail down. If you tag your social media account on somebody else, who is already engaged in a full day job. It would not really work, especially if you are going down the customer service channel. If you are looking for conversions, people are going to want to be able to interact with you, to deal with you relatively in real time, maybe or certainly within 24 hours. So if you give social media as a task to somebody who already has a full workload, chances are there, that they are not going to get back to your customer within 24 hours. You should also need to make sure it is in the hands of a right person. Do not get the intern to do because you have a 19-year-old employee and have a social media profile. It does not mean he knows how to use social media. You need somebody with a customer service background or knowledge if you are going to use it for your business, who knows how to speak to people, who knows how to handle it and hopefully should have had a bit of training on how to handle your customers when problems arise. How will your users find you? If you have a social media profile, you need to tell people that you have a social media profile. I would advise putting buttons on every page of your website with links. If you want to email your clients or do offline promotions, anything you can, to make people aware that you are present on social media or it simply means that you are contactable. This is where they will find you and this is the place where they can get in touch with you. Without doing that you are going to have a really small base, and it is not going to achieve its full potential. If you do not know why you have social media, tend to do a lot of this, just saying “Like my page, like my page”. But you are not actually giving anybody any reason to. What you end up with, there might be a lot of “Likes” but nothing else. People are not to engage with you. They are probably not your target audience. They might be your friends, your family, people who like the things that you are doing, but probably they are never going to use or become your customer. So, just going for “Like me, Like me” is not going to get you anywhere and it is not really a good credibility for your company either. You need to provide quality content. Give something that people will really like to read, like to share, things that they are going to tell their friends, things that they want to buy, services they are going to want to use. Keep them excited. If you just keep on going “I have got this product for sale” nobody is really going to be listening to you. Don’t just talk about yourself all the time. If you go to a broader perspective, share stories that are about the industry that you have, get engage with your clients. Maybe something interesting has happened to them that is related to your business. Share that. Engage people. Don’t just give them the same boring thing, because they will definitely stop listening to you. You can also read my article on how to become a great content and master yourself. You might think, like for example, in Twitter, it is all about how many followers you have got, or with Facebook, it’s about how many likes you have got. It’s really not. If they are not targeted, it does not matter if you have got a hundred or thousands of likes. Your 900 of them might not use your service, then there is no real point in having such a huge like. It is what I call a vanity metric. You feel better because you have got a big number, but it needs to be more targeted than that. You need to aim at people who are going to use your business. So, you have got re-tweets, shares on Facebook, comments on Facebook. People are engaging with you in any form of social media, sharing your Google+ stuff. Anything like that can be a real help, and it gets the word out there. What it does is that, it helps to increase your reach, which is the next thing you probably want to measure. How many people are you reaching through social media? Is it growing? Is it shrinking or is something wrong? Obviously, you want to keep growing as much as possible, but there will be a time where you might get stagnant. But ideally yo,u want to be pushing to grow your business all the time, grow the reach, grow awareness all the time. By the time that you get down to this level, a lot of people have forgotten what they started off with. So, it is always a good idea to go back to your first plan and make sure that you are measuring the relevant metrics, compared to what you have started off and wanted to achieve. You need to be measuring directly your attributable conversion, your attributable traffic or anything else, depending on what business you are in, it is going to vary but make sure that your goals match your original strategy. A lot the social media stuff, you can find in Google Analytics. If you look down at the lift-hand side, you will see a social profile area, where you can have a look, and it will tell you how many people have been converted and how much traffic you had via Google+, Twitter, Facebook and all those sorts of things. So, it is quite easy to measure. I would definitely suggest you keep an eye on that once a month or so at least the very least, and keep yourself updated, and see if things have start to go wrong, may be start looking at why. To put this all together. Plan a strategy. Give it to a responsible person. Create good quality content. Make it shareable, make it likable. Make sure your timing is right. Don’t tweet every day. Sort out your metrics and keep an eye on them. 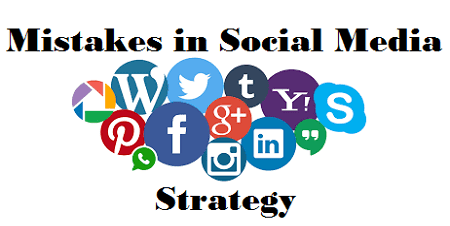 That will help you pinpoint problems and putting them all together, you will have a relatively good social media strategy. It a very nice article on the mistakes that we all have been doing in our social media campaign. I think that’s right, i also new when doing SMO, I also doing those mistakes. Thanks for sharing these great information with all, because i think many people doing those mistakes when doing SMO. Is there any possibilities of ‘information overload’ in Social Media? But they may call them ‘viral’? is this good for all? creating engaging and purposeful content is key indeed!